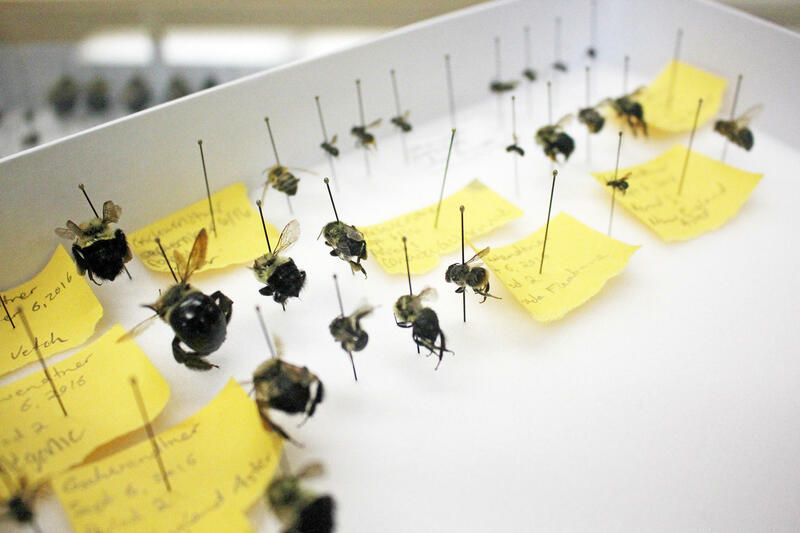 Nigel Raine keeps a collection of wild bees in his laboratory at the University of Guelph, in Canada. Farmed honeybees can compete with wild bees for food, making it harder for wild species to survive. It annoyed him because the honeybee is perhaps the one type of bee that we should worry about the least. Honeybee hives aren't natural, and they don't help the environment. In fact, they may harm it. There are thousands of bee species. Almost all of them live in the wild, hiding away in the ground or in odd cavities, like hollow plant stems. They play a vital role in the ecosystem, pollinating flowering plants. Many are in peril; some species have disappeared. Researcher Nigel Raine has a whole array of wild bees impaled on pins in his laboratory at the University of Guelph, in Canada. Many are tiny. Raine says that gardeners often assume they're flies. "If you sit down and say, 'No, that's a small, solitary bee; that's a metallic green one' — when you show them a metallic green bee in their yard, they say, 'Wow! That's amazing!' "
And then there's the honeybee: originally imported from Europe, raised and managed by beekeepers in order to make honey or to pollinate crops like almonds. It's an agricultural animal, in the same way that sheep and cattle are. When flowers are abundant, there is plenty of pollen for both honeybees and their wild cousins. But in many landscapes, or when an orchard stops blooming, farmed honeybees can compete with wild bees for food, making it harder for wild species to survive. Basically, a healthy environment needs bees — but not honeybees, Geldmann says. This week, he published a commentary in the journal Science trying to spread the word to a wider audience. "The way we're managing honeybees, in these hives, has nothing to do with nature conservation," he says. Scientists who study bees already understand this. But they struggle with how to talk to the public about it. "We're on a learning curve, all of us," says Marla Spivak, at the University of Minnesota, one of the country's most prominent bee researchers. "It's like honeybees were the portal — the door to much larger issues, conservation issues in general." Concern for honeybees helped more people understand why it's important to have more land covered with wildflowers and trees — and free from pesticides, Spivak says. Such a landscape is good for both honeybees and wild bees. "My preference is not to pit one bee against another," Spivak says. "I would prefer to live on a planet where there are bountiful flowers to support all of our bees." But the bee that needs our help the most may be that tiny green bee in your garden and not the honeybee. We've heard a lot in recent years about the struggles of honeybees, how their numbers are down. So environmentalists have rallied to their aid - even helping people to set up their own beehives. But this bothers a lot of ecologists who say that honeybee hives aren't natural and they don't help the environment. In fact, they may harm it. NPR's Dan Charles has the story. DAN CHARLES, BYLINE: Honeybees are amazing and adorable. And they suffer when people spray pesticides or mow down wildflowers. Biologist Jonas Geldmann at the University of Cambridge started to notice that among environmentalists, the honeybee has become a cause. JONAS GELDMANN: Lots of conservation organizations are promoting buying local honey and even promoting sponsorships of honeybees and that kind of stuff. So that increasingly annoyed me. CHARLES: It annoyed him because honeybees are not exactly part of nature. They were originally imported from Europe. Beekeepers keep them by the millions to make honey and pollinate crops like almonds. They're agricultural animals, like sheep or cattle. But there are thousands of other bee species living in the wild, hiding away in the ground or in hollow plant stems. Researcher Nigel Raine has a whole array of them in his laboratory at the University of Guelph, in Canada. Each one's impaled on a pin. Many are tiny. Rein says gardeners often assume they're flies. NIGEL RAINE: If you sit down and say, no, that's a small solitary bee, you know, that's a metallic green one - when you show them metallic green bees in their yard, they're kind of like - wow, that's amazing. CHARLES: A lot of wild bees are in real peril. Some species have disappeared. And when flowers are scarce, like when an orchard stops blooming, farmed honeybees and these wild bees end up competing with each other for food - for pollen - making it harder for the wild ones to survive. Basically, Jonas Geldmann says a healthy environment needs bees but not honeybees. This week, he published a commentary in the journal Science trying to spread the word. GELDMANN: The way we're managing honeybees in these human-kept hives has nothing to do with nature conservation. CHARLES: Scientists who study bees actually know this already, but they struggle with how to talk to the public about it. MARLA SPIVAK: We're on a learning curve, all of us. CHARLES: This is Marla Spivak, a bee researcher at the University of Minnesota. SPIVAK: It's like honeybees were our portal in - the door in to much larger issues - just conservation issues in general. CHARLES: Honeybees helped people understand why it's important to have more land covered with wildflowers and trees and free of pesticides. This helps honeybees and wild bees. SPIVAK: My preference is to not pit one bee against another. I would prefer to live on a planet where there are bountiful flowers to support all of our bees. CHARLES: But the bee that needs our help most may be that tiny green bee in your garden and not the honeybee. Dan Charles, NPR News. Transcript provided by NPR, Copyright NPR.